In a recent webinar, there were several sites submitted for review, and one issue that particularly refused to go away and caught the interest of many of the attendees is the use of auto-rotating images/banners on web pages. This prompted a revisit of the issue to further clarify the underlying problem, and the site under review here was Danish Jewellery. This is actually a continuation of what had been covered in another segment: Part 2: Why your Website is not Converting Well? This could be the Reason… and you may consider going over that one first. 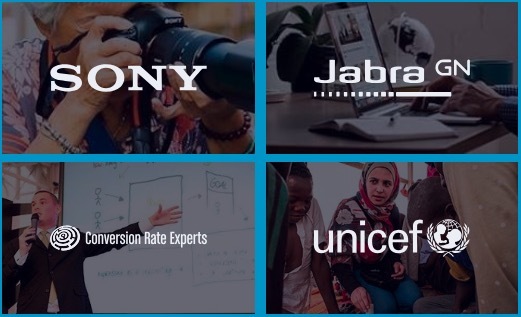 In the mentioned webinar, Convert teamed up with Bobby Hewitt of Creative Thirst, to review a number of things many websites do wrong and end up hurting their conversion optimization efforts. A quick overview would be in order…The site under review had a lot of competing elements on a single page to test. There’s a lot of movement going on and what this does is just serve as a distraction – a negative! More so when you have multiple competing elements on a page to test. This only adds to confusion on what the visitor should click on. Not only that, things go from worse to worst when these included images don’t link to other important areas you may wish to showcase. In the case of Danish Jewellery, for instance, the rotating image is not clickable anywhere and just takes you back to the page you’re on. If it’s an upcoming event you’re trying to draw attention to, you could opt to include the rotating text images in the main body of the page. This is easier for whoever is checking the site for upcoming events to see everything, and include a call to action button there as well. During the webinar (that you can access here for free) I shared some interesting insight I gained from a conversion conference I attended in Fort Lauderdale in which neuroscientists were evaluating the eye-tracking tools they used. What they discovered is that if you happen to have multiple things on a single page you want to attract attention to, moving something is going to focus the eyes’ attention to it. So if it moves down, the eye follows that movement, and so on. This is especially the case for men because they are wired to always be on the lookout for movement. The evil truth of rotating banners is that they do the opposite of what’s intended, distracting users away from your most important content. A page normally includes more than one element. If you have your main product in the slider at the top of the page and categories at the very bottom and you want your visitors to pick a category of interest, the slider is not going to help matters since it is continually moving and your eyes will focus on the slider which might make getting to the categories difficult since people are distracted. It was a similar thing the neuroscientists tested in eye tracking movement and the verdict was it distracts people a lot when something is moving all the time. It would be a great idea to test removing the rotating banner, however preposterous it may sound. This could especially be a bitter pill for marketers to swallow. To them, this is an excellent chance to convey their message, many times unable to limit the information or products they want to showcase. One thing you tend to forget though: we can all be accused of attention deficit nowadays, and the 30-second commercials we see on TV we try to mimic the concept online. However, many tend to forget that online is a completely different medium than television, movies or other forms of advertising. The types of sliding banners in question are the equivalent of having a salesperson call you every 15 seconds with an offer; buy this beautiful necklace, buy this jewelry, buy these earrings and so on. You have to make a decision in your mind on whether or not to buy. The same case when you visit a page that gives you multiple alternatives to choose from: every visitor needs to get to know what the site is about, what he/she can do on the page and where to look, what they can click on, all without a goal in mind assuming this person has never visited your site before and doesn’t know their way around. For instance, when shopping for a gift for your wife’s birthday, you find all these offers and categories that you probably think, ‘Oh, this is not relevant to my wife’s birthday, why should I look at it?’ It’s like you’re forcing the shopper to look. If you’re a marketer and trying to grapple with how to make best use of all this available space without removing the slider, try testing the speed and slow it down a bit. If you juxtapose it against a slower individual screen and the latter wins, you just got some leverage for the department to try out the slower slide. If the next test is convincing enough then you can follow it up with one that doesn’t rotate where the slides can click back to themselves. Those are two quick tests you can perform before you get to the point of removing it altogether. Another site that served as an example during the webinar is Web World that’s trying out everything at the same time. Or still sticking to Danish Jewellery that starts with everything they sell all at once. This isn’t going to optimize conversion for you. An example of that could be better demonstrated by two psychological tests carried out on jam choices. One test involved three choices of jam to choose from at a shopping store. The next involved adding the types of jam to bring the number to 27 different alternatives to choose from. Initially, making a pick was quite easy but things took a tumble when the other choices were added to the list. What happened is that it became harder for a person to choose, and the result was the buying rate decreased dramatically since customers were torn between what to go for. Same case with the page under review. Having a lot to choose from just makes the buying decision harder, thanks to the distracting rotating banner. If you want to find out more about this, or if you want to watch the entire webinar, you can do so here.